North Carolina stretches from the Tennessee border, along the high peaks of the Appalachian Mountains, across the Piedmont Plateau, and to the Atlantic Ocean. A quintessential Southern state, North Carolina covers such regions as the Great Smoky mountain range, the Piedmont Triad (Winston-Salem/Greensboro/High Point), Research Triangle (Raleigh-Durham), the Charlotte metro area, and the coastal Outer Banks. Miles of beaches and lighthouses don North Carolina's Atlantic coast. 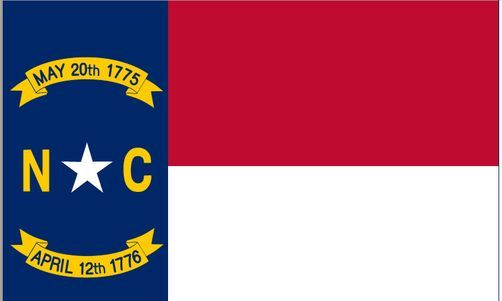 The state is known for the Wright Brothers' 1903 flight out of Kitty Hawk, the Hatteras lighthouse and dunes, Cheerwine soda, Wilmington's USS Battleship North Carolina, and its prominent NASCAR culture, with many NASCAR teams based in Mooresville and Concord, in the Charlotte area. As far as roadways go, Interstate 40 is by far the state's longest Interstate highway, entering from Tennessee in the mountains, passing by Asheville and Hickory, and the Piedmont Triad and Research Triangle, before shifting southeast away from state capital Raleigh toward its eastern terminus at Wilmington. Interstate 85 connects Charlotte with the Triad, then runs concurrent with I-40 between the Triad and the Triangle, and splits at Durham to go up into Virginia. Interstate 95 is a more eastern and rural corridor, linking Lumberton, Fayetteville, Dunn-Benson, Smithfield-Selma, Wilson, Rocky Mount and Roanoke Rapids. Interstate 77 roughly separates the mountains and the Plateau and passes right through downtown Charlotte. Interstate 26 winds its way through western North Carolina, including Asheville. 3DIs in North Carolina include Wilmington's I-140, I-440 and 540 in Raleigh-Durham, I-840 in the Triad, I-485 around Charlotte, and the Wilson-Goldsboro I-795. North Carolina's many U.S. include the northern U.S. 158, the parallel U.S. 64 and U.S. 264 connecting the Triangle with the eastern swamps and Outer Banks, U.S. 1 through the lower Plateau, U.S. 301 paralleling I-95, U.S. 70 cutting through the central region of the state, and U.S. 74 and 76 to the south. Major state highway corridors are NC-11, NC-12, NC-24, NC-50, NC-87 and NC-903, among several others.